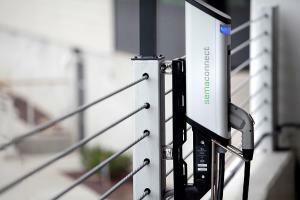 DENVER, USA, April 5, 2019 /EINPresswire.com/ — SemaConnect, the leading provider of electric vehicle charging stations to the North American commercial and residential property market, announces that Denver’s Confluence Apartments has selected SemaConnect to provide three Series 6 wall-mounted EV charging stations for resident use. The newly built Confluence high-rise is considered Denver’s most luxurious apartment community. The SemaConnect Series 6 charging stations used by The Confluence are designed specifically for shared use at Class A properties. Among the features this series offers are wireless technology, interactive LED lights, backlit LCD screen, smart card authorization, and ENERGY STAR® certification. The three stations are open to Confluence residents and can be found in the underground resident garage.